Safer Roads Humber has joined forces with Sewell on the go for the Safer on the go campaign, which includes hints and tips on driving safely and efficiently this winter. The campaign, which launches Monday, October 17th, is split into three fortnights – Save Fuel, Car Care and Forecourt and Road Safety – and runs until November 25. Safer Roads Humber will carry out free vehicle safety checks at Sewell on the go’s Hull West site on the A63 on November 24, which also falls within national Road Safety Week. The team will be on site from 8.30am to 4pm, providing advice and guidance to ensure motorists are as safe as possible on the roads this winter, with participating drivers receiving a free ice scraper. PC Simon Carlisle, Casualty Reduction Officer for Humberside Police, said: “Safer Roads Humber is delighted to join forces with Sewell on the go for the Safer on the go campaign, as it highlights how vital it is to ensure safety on the roads, particularly during the winter months. “Sewell on the go Hull West is an ideal place for us to check vehicles before drivers continue onto their destination. It’s in a great location on the A63, approaching the M62, and is the start of a longer journey to other parts of the country for many motorists. “It is vital vehicles and the drivers are prepared for the journey and checks include making sure tyres have the correct tread depth and pressure, checking windscreen wipers and lights, and topping up screen wash. Safer Roads Humber comprises of East Riding of Yorkshire Council, Hull City Council, Humberside Fire and Rescue Service, Humberside Police, North East Lincolnshire Council and North Lincolnshire Council, all working together to deliver a range of casualty reduction projects across the region. Alongside support from the group, local primary school children have also been involved in helping to promote the three fortnights within the Safer on the go campaign. They have designed posters for each theme and three winners chosen from each fortnight will receive a hamper of toys and treats for their efforts. One youngster from the nine finalists will win a Samsung tablet, while each participating primary school will receive £50 from Sewell on the go. East Hull pupils Finlay Hopper, from Spring Cottage Primary School, and Sophie Cain and AJ Appleby from Estcourt Primary Academy, were the three winners chosen in the Save Fuel Fortnight category. The winners for Car Care and Forecourt and Road Safety fortnights have yet to be announced. Finlay, 10, said: “I can’t believe I won. When the headteacher told me, I was so surprised and proud of myself. Patrick Sewell, Managing Director of Sewell on the go, said: “We’re delighted to have the backing of Safer Roads Humber as part of our Safer on the go campaign. “Collaboration like this can only be positive and it completely links in with us doing the right thing for our customers. “These simple vehicle checks are so important and can make all the difference. We hope our customers find the hints, tips and checks useful. As part of the Safer on the go campaign, Save Fuel Fortnight runs from October 17-28, followed by Car Care Fortnight from October 31-November 11, and Forecourt and Road Safety from November 14-25. Child seat safety clinics, which ensure car seats are fitted correctly, will also take place at Sewell on the go South Cave from 10am to 3pm on November 24, and at Sewell on the go Sutton from 10am to 3pm on November 25. 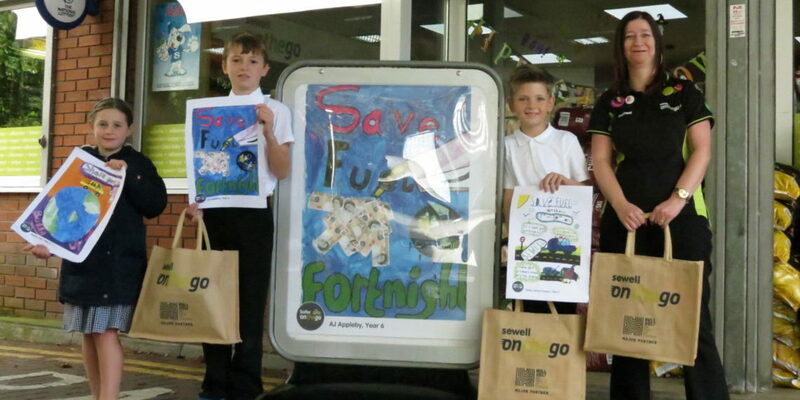 There is still time for primary school children to enter the poster competition for Forecourt and Road Safety Fortnight, with the deadline on October 28. To enter, or for more information, call Hannah Tillison on 01482 713083.